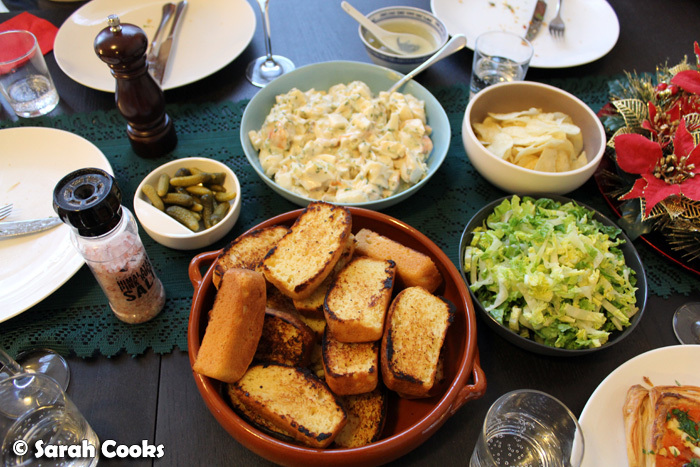 We had a really fun, intimate little dinner party in between Christmas and New Year's. I really love that time of year: the hustle and bustle from Christmas is over, the streets are empty, you're off work (or if you are at work it's a pretty slack week), and no-one's seriously thinking about detoxes or diets yet. I've previously mentioned that I seem to keep making deals with my friends where I'll make lobster rolls if they bring lobster tails, and this is exactly what happened here. The photo above is my favourite one from the night, as you can see (almost) everything that was going on that night - Normandy cider, the lobster tail, brioche buns proving on the right, the bowl of shredded cos, Alaina's fab chocolate and macadamia blondies in the orange tin and finally, the mini-Christmas pudding in the double boiler, ready for steaming. 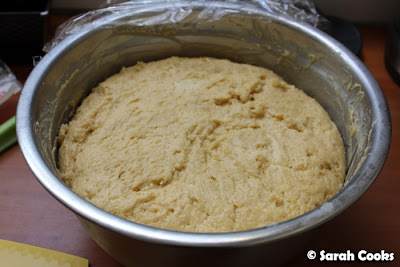 Here's the brioche dough - a very easy, delicious no-knead recipe, the same one I used last time I made lobster rolls. 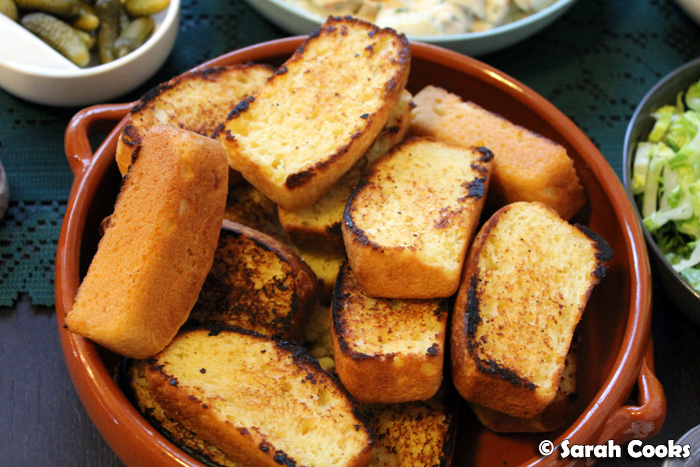 As they were a bit flat last time, this time I baked them in a mini-loaf tin. 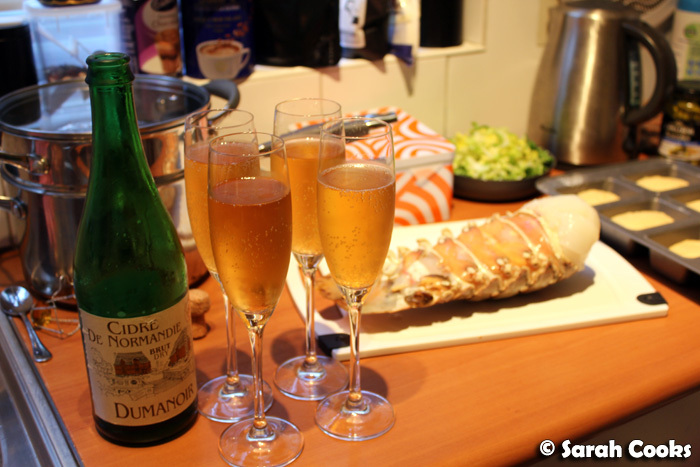 We timed it so that the galette would go into the oven as my friends arrived; while it was cooking we poached the lobster (and got stuck into the cider!) 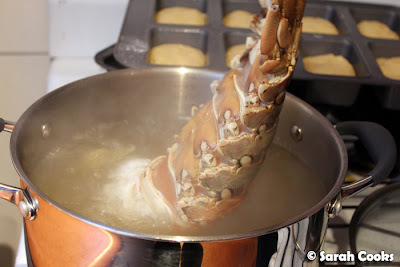 When both galette and lobster were cooked, I popped the mini-brioche loaves into the oven and allowed the lobster to cool. This gave us time to eat the galette. 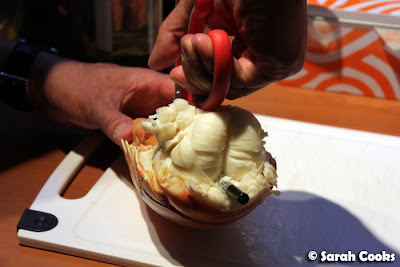 After that, we had to chuck the pudding on to steam, make the lobster salad, and then dig in! 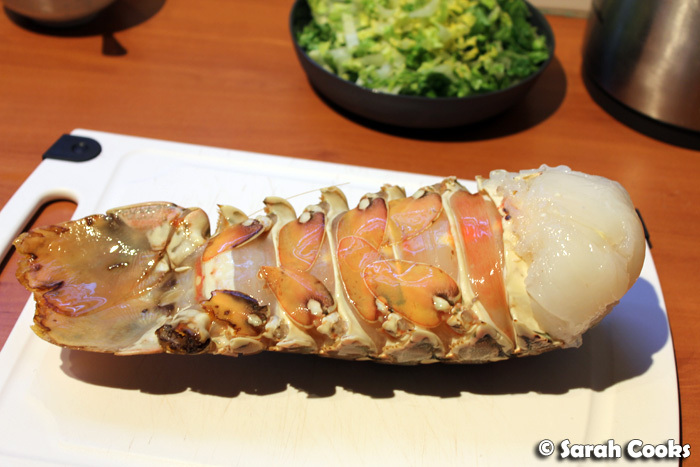 This whopping lobster tail was nearly a kilo - more than enough for us! Thank-you Alaina! We poached the lobster in what Adrian calls a court bouillon - simplified of course - water, stock, lemon zest and bay leaves. Another trick he taught me was to hold the thinner part of the lobster out of the cooking liquid for the first few minutes, so that the thick part can cook through without the thinner part becoming tough. A chopstick (wooden, emphatically not plastic) inserted in the tail prevents the tail from curling up as it cooks. Zomg... delicious delicious lobster meat. Come to Mamma! I used the same Gourmet Traveller recipe as last time for the lobster salad - the Tabasco in the recipe gives it a really fabulous kick. 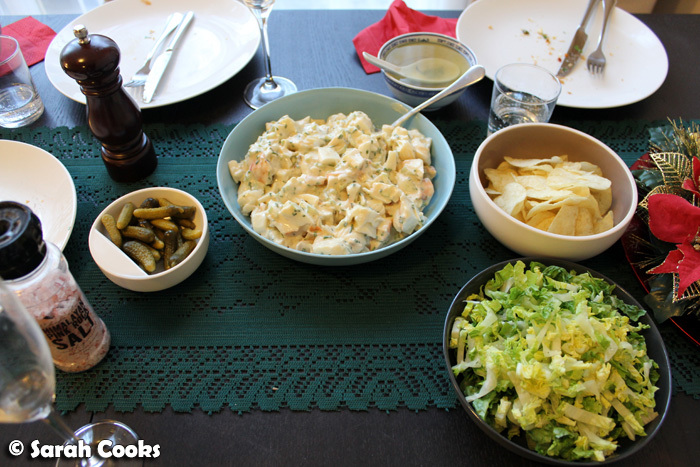 Accompaniments below: cornichons, potato chips, shredded cos lettuce. 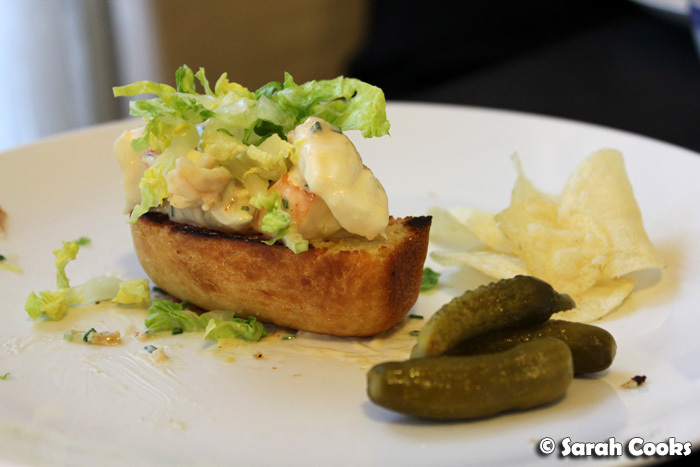 The mini-brioche loaves turned out to be too small to split into the traditional "cross between a hot dog bun and a piece of bread folded in half", that you'll see if you Google-Image "New England Lobster Roll", so we simply cut them in half and toasted them briefly in a dry frying pan. It was an "Assemble-Your-Own" dinner, which was not only convivial, but also allowed us to make funky lobster-roll creations, hehe! 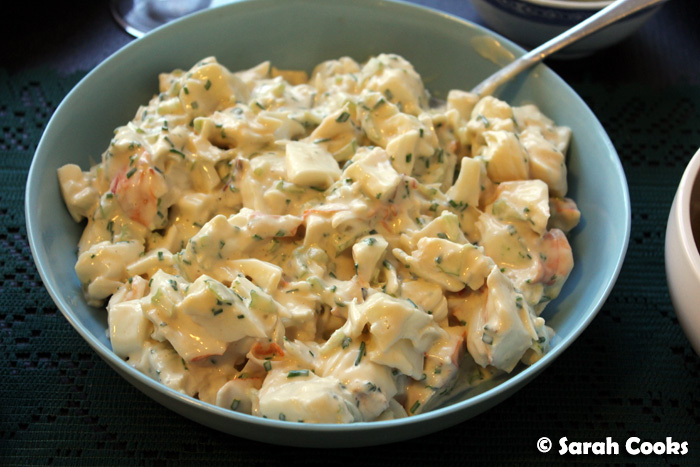 That lobster salad is amazing! 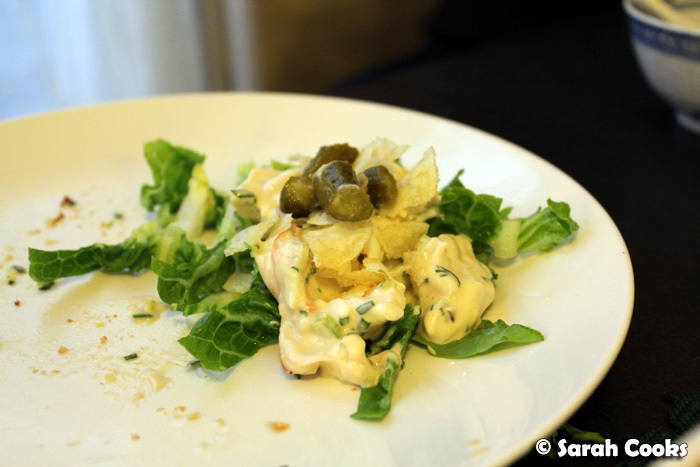 Such a fab recipe - I love the crunch of the celery, the heat of the Tobasco and the flavour of the chives. It is a little oily though, so perhaps next time I'll use a mix of crème fraîche and mayonnaise, rather than just mayo. I'm still working towards my ultimate lobster roll - whilst I've got the filling just the way I want it, I don't know if brioche is the best dough for it, as it is a little heavy. Perhaps I'd be better off with a fluffy, light-as-a-feather supermarket hot dog bun, or even those sweet milky buns you can get at Vietnamese bakeries. More experimentation is needed! And finally... dessert. Although I can't say we were too hungry after all that food! Lucky it was a small Christmas pudding! 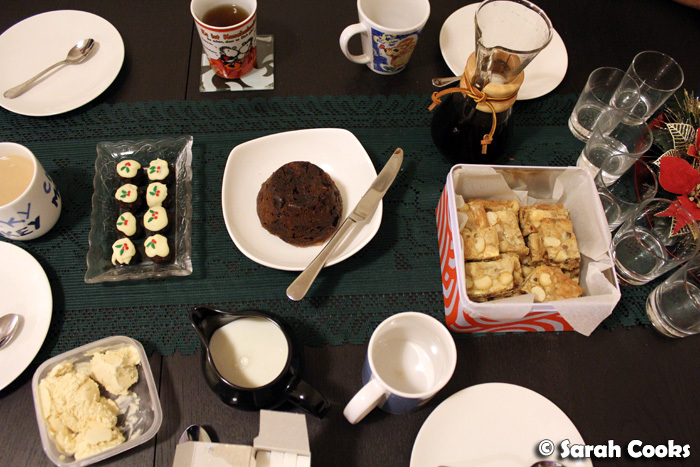 Puddini bonbons, Christmas pudding, Chocolate macadamia blondies, iced rum sauce and coffee in my fab new Chemex Coffee pot! 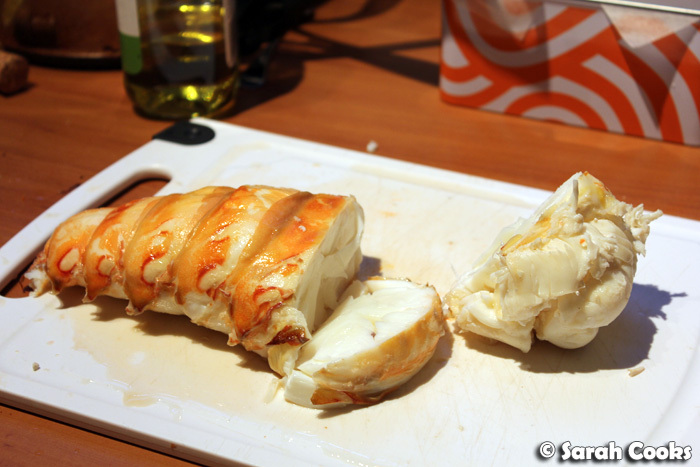 Oh for friends with lobster tails! Lobster pickle sandwich?! Omg! Sounds delish!!!!! Thanks Agnes! Because I entertain a lot, it makes sense for me to say yes when my friends ask "can I bring anything?" hehe. Although I must say the lobster tails were a pretty sweet deal! !